Mr. Roth has been representing and helping injured workers and others for over 25 years. He has experience representing individuals as an attorney in personal injury cases, medical and legal malpractice claims, workers' compensation cases, and with social security disability. Mr. Roth brings a valuable perspective to his work because he also spent time representing doctors in medical malpractice claims and manufacturers in asbestos cases. However, for the past two decades, Mr. Roth has devoted his practice almost exclusively to representing individuals who have been hurt at work or in other accidents. "My goal is to achieve the best possible outcome with the least amount of stress and disruption to my clients." Mr. Roth is a member of the Ohio and Kentucky Bar Associations, and practices in both states. 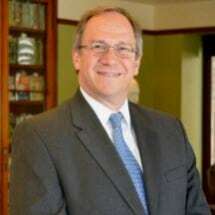 He also is a long-time member of the Cincinnati Bar Association, and is active in many of its committees. Mr. Roth received his B.A. degree in biology from Colgate University and his J.D. from the University of Kentucky. He is active in the community and serves on several local boards. Mr. Roth and his wife have two grown children and reside in Cincinnati.